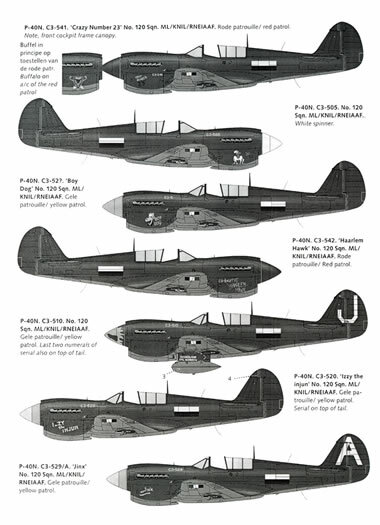 Conclusion: High quality decals offering interesting options for P-40N kits in all the major scales. This is a a new decal release from Dutch Profile. 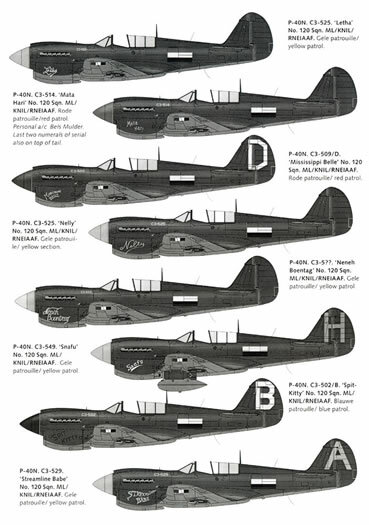 This time the sheet covers P-40Ns of the Royal Netherlands East Indies Army Air Forces (RNEIAAF) in World War II (although the sheet’s title states that it is for P-40 Es and Ns there are only P-40Ns on the sheet). 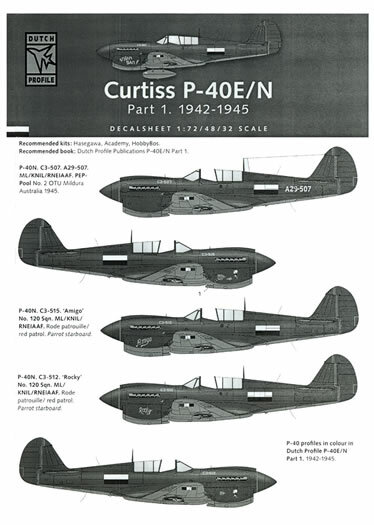 As per other decal sheets we have seen from Dutch Profile, the sheet ties in with their recent release of their History, Camouflage and Markings series of books with the tie-in book for this sheet being Operations of the Royal Netherlands East Indies Army Air Force Part 1 1942 – 1945 Curtiss P-40E/N. The sheet provides markings for markings for 23 P-40Ns and a single Lockheed L12 in all in 1/32, 1/48 and 1/72 scales although you don’t get all of the markings for all of the scales. P-40N C-3-507 (the Dutch serial). Depicted as it appeared at the RAAF’s 2 Operational Training, Mildura, South Australia in 1945. The machine is in olive drab over neutral grey camouflage (as are just about all of the options on the sheet) with the standard RNEIAAF national insignia “flag” markings on either side of the fuselage and port upper and port and starboard lower wing surfaces. The Dutch serial number is worn on both sides of the nose in grey (standard placement). The machine also wears an RAAF serial of A29-507 which the book advises is “fake”. Markings are provided in 1/72 and 1/48 scale only. P-40N C3-515 ‘Amigo’ of “red patrol” 120 Squadron as it appeared at Canberra, ACT, Australia in 1944. In standard olive drab over neutral grey camouflage finish with a red spinner and “flags” on either side of the fuselage and port upper and port and starboard lower wing surfaces. The machine also wears nose art in the form of the word ‘Amigo’ in white outlined with red on the port side of the nose as well as the B Flight “parrot and the name “Gooney Bird” in yellow on the starboard side of the nose. Markings are provided in all three scales. P-40N C3-512 ‘Rocky’ of Red Patrol 120 Squadron, Canberra, in 1944. In standard olive drab over neutral grey camouflage finish with a red spinner and “flags” on either side of the fuselage and port upper and port and starboard lower wing surfaces. The machine also wears nose art in the form of the word ‘Rocky’ in white on the port side of the nose as well as the B Flight “parrot on the starboard side of the nose. Markings are provided in all three scales. P-40N C3-541 ‘Crazy Number 23’ of 120 Squadron’s Red Patrol as it appeared at Merauke, New Guinea when the squadron was assigned to the RAAF’s 72 Air Defence Wing. In standard olive drab over neutral grey camouflage finish with a red spinner and “flags” on either side of the fuselage and port upper and port and starboard lower wing surfaces. 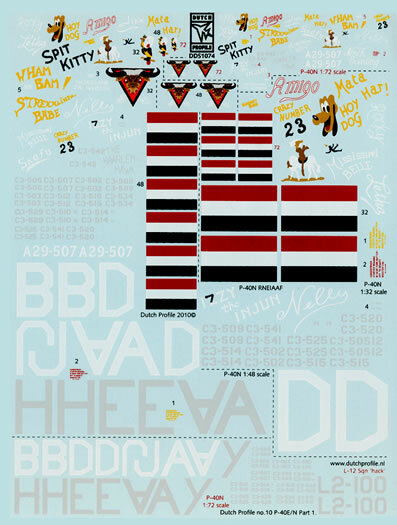 The machine also wears nose art in the form of the words ‘Crazy Number 23’ in yellow and black on the port side of the nose as well as the 120 Squadron’s “angry buffalo” badge on the starboard side of the nose. Markings are provided in all three scales. P-40N C3-505 of 120 Squadron as it appeared at Merauke, New Guinea in 1944. It wears a standard olive drab over neutral grey camouflage finish with a white spinner and “flags” on either side of the fuselage and port upper and port and starboard lower wing surfaces. The machine sports nose art in the form of a horse riding Don Quixote(? )on the starboard side of the nose. Markings are provided in all three scales. P-40N C3-52? ‘Hoy Dog’ belonging to Yellow Patrol as it appeared at Merauke, New Guinea in 1944. In standard olive drab over neutral grey camouflage finish with a yellow spinner and “flags” on either side of the fuselage and port upper and port and starboard lower wing surfaces. The machine wears nose art in the form of Walt Disney’s “Pluto” and the words ‘Hoy Dog’ in yellow on the port side of the nose. Interestingly, the companion book shows artwork of the same aircraft but wearing the name ‘Boy Dog’ rather than ‘Hoy Dog’. Markings are provided in all three scales. P-40N C3-542 ‘The Haarlem Hawk’ of 120 Squadron’s Red Patrol as it appeared at Merauke, New Guinea in 1944. In standard olive drab over neutral grey camouflage finish with a red spinner and “flags” on either side of the fuselage and port upper and port and starboard lower wing surfaces. The machine sports the name ‘The Haarlem Hawk’ in light grey on the starboard side of the nose. The machine’ serial is also painted on the lower nose cowling which is unusual. Markings are provided in 1/72 and 1/48 scales. P-40N C3-510 ‘J’ of 120 Squadron’s Yellow Patrol as it appeared at Merauke, New Guinea in 1944. In standard olive drab over neutral grey camouflage finish with a peeling yellow spinner that shows the original olive drab paint beneath the yellow and “flags” on either side of the fuselage and port upper and port and starboard lower wing surfaces. A large white letter J is worn on the fin and rudder and a white ‘bomb graffiti’ and a small white 510 decals for the drop tank are also provided. Markings are provided in 1/72 and 1/48 scales. P-40N C3-520 ‘Izzy the Injun’ of 120 Squadron’s Yellow Patrol as it appeared at Merauke, New Guinea in 1944. In standard olive drab over neutral grey camouflage finish with a yellow spinner and “flags” on either side of the fuselage and port upper and port and starboard lower wing surfaces. The machine sports the name ‘Izzy the Injun’ in white on the port side of the nose and the serial is repeated on the top of vertical stabiliser in one inch numerals in light grey. Markings are provided in all three scales. P-40N C3-529 ‘A’ ‘Jinx’ of Yellow Patrol as it appeared at Merauke, New Guinea in 1944. In standard olive drab over neutral grey camouflage finish with a yellow spinner and “flags” on either side of the fuselage and port upper and port and starboard lower wing surfaces. The machine sports the name ‘Jinx’ in white on the port side of the nose. A large white letter A is worn on the fin and rudder. Markings are provided in 1/72 and 1/48 scales. P-40N C3-525 ‘Letha’ of Yellow Patrol. In standard olive drab over neutral grey camouflage finish with a yellow spinner and “flags” on either side of the fuselage and port upper and port and starboard lower wing surfaces. The machine sports the name ‘Letha’ in white on the port side of the nose. Markings are provided in 1/72 and 1/48 and 1/32 scales. P-40N C3-514 ‘Mata Hari’ of 120 Squadron’s Red Patrol as it appeared at Merauke, New Guinea in 1944. In standard olive drab over neutral grey camouflage finish with a red spinner and “flags” on either side of the fuselage and port upper and port and starboard lower wing surfaces. The machine sports the name ‘Mata Hari’ in yellow on the starboard side of the nose. The ‘last two’ numerals of the machine’ serial is also painted on the top of the vertical stabiliser. Markings are provided in 1/72, 1/48 and 1/32 scales. P-40N C3-509 ‘D’ ‘Mississippi Belle’ of Red Patrol as it appeared at Merauke, New Guinea in 1944. In standard olive drab over neutral grey camouflage finish with a red spinner and “flags” on either side of the fuselage and port upper and port and starboard lower wing surfaces. The machine sports the name ‘Mississippi Belle’ in light blue on the starboard side of the nose. The companion book shows the name in light blue whilst the decal is provided in white. A large white letter D is worn on the fin and rudder. Markings are provided in 1/72, 1/48 and 1/32 scales. P-40N C3-525 ‘Nelly’ of 120 Squadron’s Yellow Patrol as it appeared at Merauke, New Guinea in 1944. In standard olive drab over neutral grey camouflage finish with a yellow spinner and “flags” on either side of the fuselage and port upper and port and starboard lower wing surfaces. The machine sports the name ‘Nelly’ in white on the starboard side of the nose. Markings are provided in 1/72, 1/48 and 1/32 scales. P-40N C3-5?? ‘Neneh Boentang’ (Grandmother-in-Law) of 120 Squadron’s Yellow Patrol as it appeared at Merauke, New Guinea in 1944. In standard olive drab over neutral grey camouflage finish with a yellow spinner and “flags” on either side of the fuselage and port upper and port and starboard lower wing surfaces. The machine wears the name ‘Neneh Boentang’ in white on the starboard side of the nose. Markings are provided in 1/72 scale only. P-40N C3-549 ‘H’ ‘Snafu’ of Yellow Patrol as it appeared at Mokmer on Biak Island, New Guinea in 1945. Probably one of the most illustrated RNEIAAF aircraft; it is finished in standard olive drab over neutral grey camouflage finish with a yellow spinner and “flags” on either side of the fuselage and port upper and port and starboard lower wing surfaces. The machine sports the name ‘Snafu’ in white on the port side of the nose and a large medium grey letter H on the fin and rudder. Markings are provided in 1/72, and 1/48 scales. P-40N C3-502 ‘B’ ‘Spit Kitty’ of Blue Patrol as it appeared as it appeared at Merauke, New Guinea in 1944. The machine is finished in standard olive drab over neutral grey camouflage finish with a blue spinner and “flags” on either side of the fuselage and port upper and port and starboard lower wing surfaces. The machine sports the name ‘Spit Kitty’ in blue on the port side of the nose and a large white letter B on the fin and rudder. Interestingly, the companion book has the name in blue whilst the decal sheet has it as black. Markings are provided in 1/72, and 1/48 scales. P-40N C3-529 ‘A’ ‘Streamline Babe’ of Yellow Patrol as it appeared at Merauke, in 1944, New Guinea in 1945. It is finished in standard olive drab over neutral grey camouflage finish with a yellow spinner and “flags” on either side of the fuselage and port upper and port and starboard lower wing surfaces. The machine sports the name ‘Streamline Babe’ in yellow on the port side of the nose and a large medium grey letter A on the fin and rudder. Markings are provided in 1/72, and 1/48 scales. P-4-N C3-500 ‘Y’ of Red Patrol as it appeared at whilst based at Mokmer on Biak Island, New Guinea in 1945. It is finished in standard olive drab over neutral grey camouflage finish with medium green “blotching” on the wings, and horizontal and vertical stabilisers as well as a red spinner and “flags” on either side of the fuselage and port upper and port and starboard lower wing surfaces. A large medium grey letter Y is worn on the fin and rudder. Markings are provided in 1/72scale only. P-40N C3-534 ‘E’ of Blue Patrol as it appeared at whilst based at Mokmer on Biak Island, New Guinea in 1945. It is finished in standard olive drab over neutral grey camouflage finish with medium green “blotching” on the wings, and horizontal and vertical stabilisers as well as a blue spinner and “flags” on either side of the fuselage and port upper and port and starboard lower wing surfaces. A large medium grey letter E is worn on the fin and rudder. Markings are provided 1/72, and 1/48 scales. P-40N C3-546 another of Major Maurenbrecher’s personal mounts from the July of 1945. It is in overall natural metal finish apart from the vertical stabiliser and the top of the engine cowl. The intake lip is red as is the spinner which also sports a thin white band. It also wears the standard “flags” on either side of the fuselage and port upper and port and starboard lower wing surfaces. No serial is provided. The odd man out and the final option on the sheet is the Squadron’s “hack” machine, a Lockheed L12 serial L2-100. It wears a camouflage of olive drab upper surfaces over natural metal undersides with either white or silver spinners and DF football. The standard “flags” are worn on either side of the fuselage and port upper and port and starboard lower wing surfaces. The machine also wears the Squadron’s “angry Buffalo’ badge but the placement guide advises you to “remove the white details” from the badge. Markings are provided in 1/72 scale only. The placement guide is a double sided A-4 sized sheet that carries black and white profiles of each option. 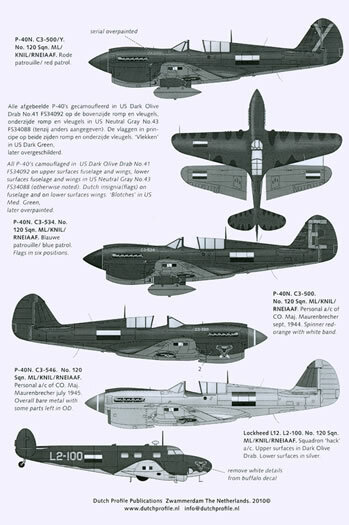 The profiles (less P-40N C3-525 ‘Letha’) are all provided in colour in the companion book and to be truthful, you would be struggling to model the aircraft correctly just using the placement guide as there is no reference at all to the spinner colours. The decals themselves have are silk screen printed and whilst thin, look to be opaque enough for the whites to remain so when applied to the olive drab finish that they are destined for. The decals and the placement guide come packed in a clear plastic zip loc bag. A busy sheet indeed and it will supply you with markings in all three of the popular scales to produce the machines of a little known air force of the Pacific War. Thanks to Luuk at Kits at War for the review sample.